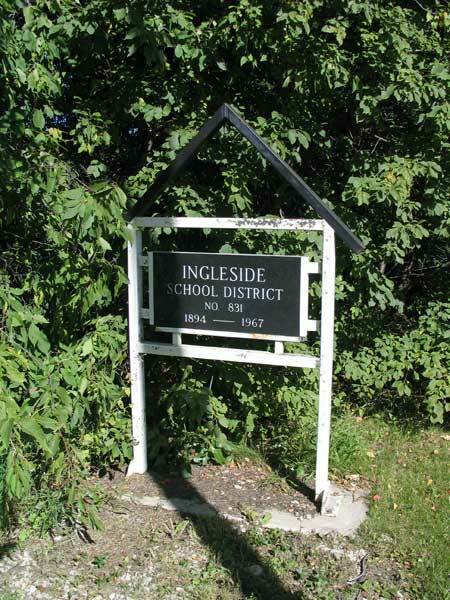 Ingleside School was formally established in November 1894. A building was constructed in the northwest quarter of 22-10-4 west of the Principal Meridian, in the Rural Municipality of Portage la Prairie. In 1899, the building was moved to SW28-10-4W. The school closed in April 1967 and was consolidated into Oakville School. The building was later sold to the Grand Hutterite Colony. A commemorative sign remains at the school site. The teachers who worked at Ingleside School included Alice Bowler, Ethel Kearns, V. M. Hartlem, Marion Qually, Hilda Vint, Verna Whitfield, Hilda Vint, Verna Paulin, Lottie Loosmore, Mary Grant, Mae Ingram, Marge Denton, Edra Bennett, Muriel Precious, Ella Klass, John Forbes, Hazel Kernaghan, Alice Diehl, Roberta Johnson, Mrs. Parr, Mary Spencer, Joyce Cartwright, Anne Couch, Catherine Freeborn, Louise Anderson, Donna Williams, Mary Bogue, Helen Freisen, Doris Hansley, Doreen Vassart, Margaret Medwid, Margot Lane, and Helen Karnafel.